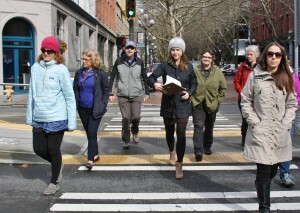 Gusting winds topped with consistent rain didn’t stop a new cohort of volunteers from attending a March morning Neighborhood Walking Ambassador training in Pioneer Square. 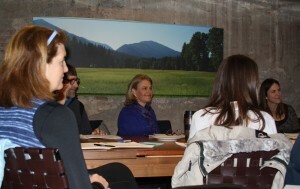 Two sessions, an evening and a morning one, gathered “intrepid walkers,” said Lisa Quinn, at the Feet First office. 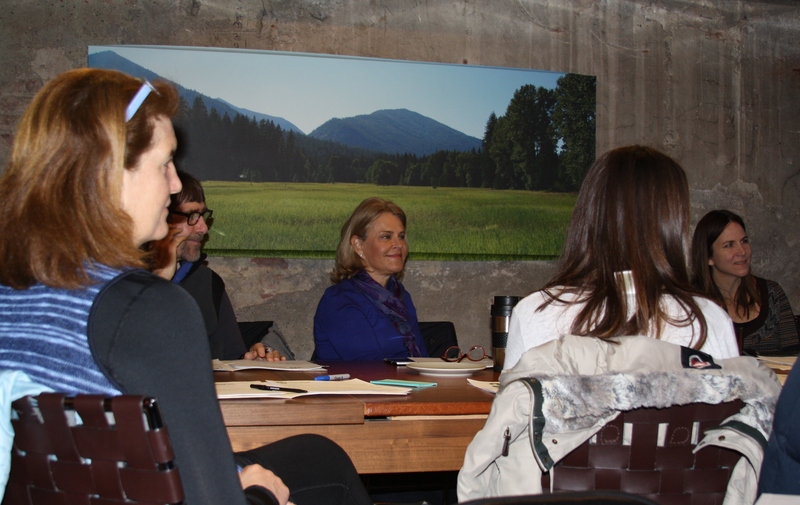 Lisa, the executive director of Feet First, hosts two trainings a year, welcoming new ambassadors to Feet First and its mission. Neighborhood Walking Ambassadors support the Feet First mission to get more people walking for health, transportation, environment, community, and, for the simple fun of it. Walking Ambassadors design walks that engage people to explore their neighborhoods or discover another area of their communities. 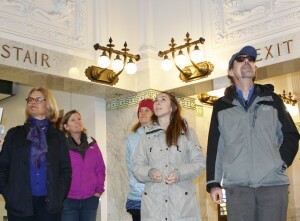 The walks inspire ambassadors to share information about what makes a great place to walk. The walks can be brisk or casual. They can challenge with stairways and inclines, or mosey through gardens and a farmers’ market. The beauty of this program, is that the diversity of ambassadors leads to a diversity of walks, and connects people to walking. Welcoming new walking ambassadors is a great opportunity to meet new people who share an enthusiasm for walking. The training is intended to give people a broad understanding of the organization, as well as provide support in designing and facilitating walks. The training wouldn’t be complete, of course, without a walk. Lisa led a brief walk around Pioneer Square in Seattle serving as a p erfect example of a Feet First walk. 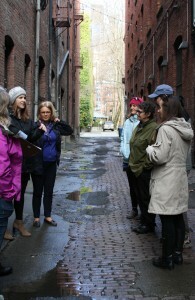 From the NORD Alley, beautifully textured with its brick and art installations, to refurbished King Street Station, to the new Weyerhaeuser building going up in Occidental Square, participants soaked in history, architecture, pedestrian access, and urban development – all in just 20 minutes. 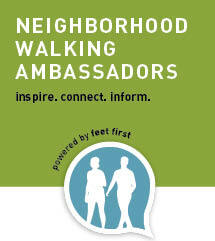 Feet First Neighborhood Walking Ambassador trainings are held annually in March. Feet First walks, however, take place throughout the year. Walks average from 1.5 to 2 hours in length. To find your next walking adventure, click here: Feet First Walks. Sharrow, also known as shared lane pavement marking: bicycle symbol with two chevrons above it marked on a roadway to indicate that this is a shared lane. Traffic calming: Effort to slow the speed of passing cars through traffic circles, speed humps, speed limit signs that use radar to show drivers how fast they are going. Bike box, also known as advanced stop line (ASL) and advanced stop box: markings at signals that guide bikes ahead of cars and keeps bicycles out of cross walks. Buffer: A barrier between the street and the sidewalk or pathway, such as parking blocks, that create safer and pedestrian-friendly routes. Source for terms: U.S. Department of Transportation, City of Seattle, Pedestrian Master Plan.